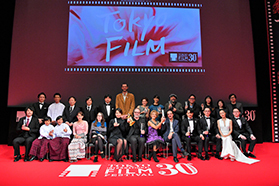 This year marks the 31st edition of the Tokyo International Film Festival (TIFF), the only Japanese ﬁlm festival accredited by the International Federation of Film Producers Associations (FIAPF). * TIFF started in 1985 as Japan’s ﬁrst major ﬁlm festival. Since then, it has grown to become one of the biggest ﬁlm festivals in Asia. TIFF seeks out excellent ﬁlms from around the world and brings them to Tokyo, where ﬁlmmakers and ﬁlm fans can enjoy them, meet emerging ﬁlmmakers, and be inspired. *The International Federation of FILM Producers Associations (FIAPF) is an international organization that oversees issues related to the film industry and international film festivals. Over the ten days of the festival, ﬁlms from a variety of genres will be shown in several sections. One ﬁlm from the Competition section, a carefully chosen selection of premieres by talented ﬁrst-timers and recognized directors, will be awarded the Tokyo Grand Prix. The Competition section is garnering considerable attention from world ﬁlmmakers. This year, there were 1,829 submissions from 109 countries and regions. The 24th winner of the Grand Prix was Untouchable (France), which later set a world record for attendance for a French language ﬁlm and was a long-running hit in Japan. 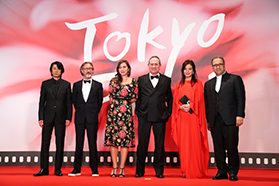 Since its inception, the Tokyo International Film Festival has been dedicated to discovering and cultivating new talent, and has contributed to the careers of countless international filmmakers. 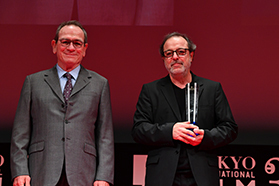 Past award winners include such directors as Michel Hazanavicius, whose 2011 film The Artist won five Academy Awards, and Alejandro Gonzalez Iñarritu, who went on to win Academy Awards for Best Director for two consecutive years with Birdman or (The Unexpected Virtue of Ignorance) in 2015 and The Revenant in 2016. Koji Fukada, whose work has also been featured several times in the festival, received the Un Certain Regard Jury Prize at the 2016 Cannes Film Festival with Harmonium. During the festival, ﬁlm fans of all ages gather in Tokyo to enjoy TIFF’s many colorful events every year. These include seminars, symposiums and workshops for students, professionals, and business people. TIFF also holds interactive programs to promote discussions and business networking. As part of the Japan Content Showcase 2018, the TIFFCOM content market will be held Oct. 22-25. Last year, TIFFCOM hosted 371 exhibitors and more than 1,549 buyers from around the world, becoming the most active film/TV/anime/music market in Asia. TIFF has a very strong alliance with the market, allowing the festival to provide a platform in Tokyo for networking with representatives of the world‘s ﬁlm industries, developing international co-productions, and promoting the global ﬁlm business. LINE Corporation / TSUMIKI INC.
UNIJAPAN is a non-profit organization established in 1957 by the Japanese film industry under the auspice of the Government of Japan ( the Ministry of Foreign Affairs (MOFA) and the Ministry of Economy, Trade and Industry (METI), for the purpose of promoting Japanese cinema abroad. And we joined hands with the organizer of Tokyo International Film Festival (TIFF), forming a new organization. Those results we became Japan Association for International Promotion of the Moving Image,called 'UNIJAPAN'. CoFesta, the Japan International Contents Festival, is a project designed to enhance the promotional capabilities of events related to Japan’s distinctive gaming, anime, manga, characters, broadcasting, music, movies, and other content industries, as well as events in content-related industries such as fashion and design, so that these events can more effectively reach international audiences.